John H. Drew, farmer, contractor, real-estate operator and co-developer along with Hugh C. MacFarlane, the cigar king of West Tampa, bought the land in this area and turned it into a private landing field seen here. Soon afterwards, the city bought this land and improved the landing field. 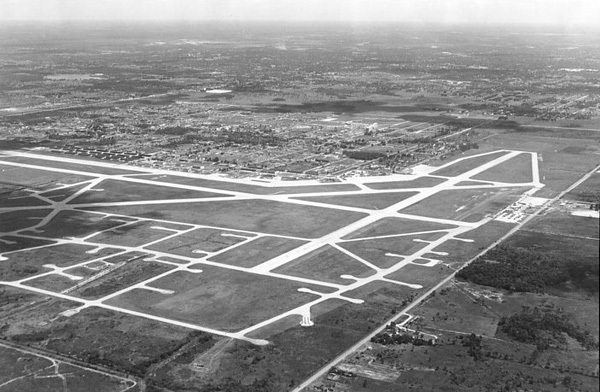 In the early 1940s, Vera Avenue out of MacDill Airfield would be extended northward across the middle of this photo, to connect to Drew Airfield, and be renamed Dale Mabry Blvd. Drew Airfield would become the site of Tampa's first international airport. The development of Drew Field was a WPA project of major importance. Pioneer pilots who came to Tampa in the WW1 days and before that, used Benjamin Field on Howard Avenue as a landing place. Benjamin Field was part of a tract of land given to Henry B. Plant by George N. Benjamin, one of the founders of West Tampa, as an inducement to the railroad magnate to build the Tampa Bay Hotel. The field was used in the 1920s as the site for an armory. During the Florida land boom of the 1920s, many attempts were made by private individuals to establish air fields on the outskirts of Tampa, but no adequate field was provided. In 1926 and 1927, commercial aviation developed so quickly that Tampa officials finally decided that the city must have an airport if it expected to keep in step with the times. After long discussions regarding sites, the city finally leased for 5 years a 160-acre tract in the Rocky Point district owned by John Higley Drew, a farmer and an avid aviation enthusiast. The lease with an option to buy was signed Jan. 1, 1928. The old City Commission had agreed to pay $500 annually for five years, starting in 1927, and gave Drew the gas and oil concessions on the field. Soon afterward, an adjoining 80-acre tract was leased from the Chicago-Tampa Development Company. Space was leased to A.B. McMullen for an air school and many of Tampa's first flyers took lessons there. Air meets were held in Feb. 1928 and Feb. 1929. In May 1929, an $18,000 hangar was built by the city. Drew Field was considered for the site of the municipal airport, but it contained few airport amenities. Tampa Mayor Perry Wall receives a bag of mail from the pilot of the first airmail delivery to Tampa at Drew Field. To the left of Mayor Wall is Postmistress Elizabeth Barnard, April 1, 1926. Tampa mayor Perry Wall (far right) and Postmistress Elizabeth Barnard at Drew Field with Florida Airways airmail plane and personnel, 1926. The 160-acre tract stretched from Tampa Bay Boulevard southward to Michigan Avenue (not called Columbus Drive until 1933), and it did not provide smooth sailing to start with. The city paid $10,500 to Drew to dig up stumps and clear the land, but the work must not have been completed by September 1929. Heavy rains brought complaints that the airport had become a huge mud hole, with stumps scattered about petrifying pilots seeking to land or take off. Conditions were so adverse that the company providing airmail service to Tampa announced it was switching to Lakeland until things improved. Sheriff L.M. Hatton, flying a small plane reportedly hit a soft spot on the field and took a nosedive into the mud. The A.B. McMullen Flying School stopped solo flights by its students until the airport dried out. And worst of all, there was real concern that the city might lose its status as a stop for the New York, Rio and Buenos Aires airline (NYRBA). 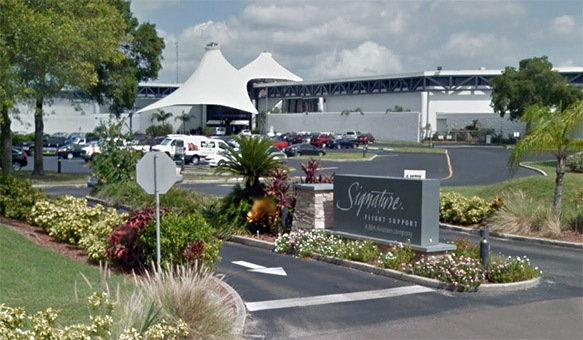 The recently constructed hangar didn’t have a solid floor, and aviators complained that the structure had been built "near a low corner, not near the center" of the property, according to The Tampa Tribune. In other words, the mud was making a mess of the hangar, too. On Sept. 12, the Montevideo, a NYRBA airship, had to land off Davis Islands, where a yacht waited with a signal torch. A telegram to Charleston had warned the pilot not to hazard the mud at Drew Field. Another amphibian plane put down into the bay near the Bayshore Royal Hotel after a heavy storm broke as the pilot approached Drew. A Tribune reporter and two small boys rowed the crew ashore. Later the decision was made to move the plane to Drew Field, but another "blinding rain" brought a "perilous landing" and the airship hit a stump. All of these incidents were described in detail by The Tribune in what became a concentrated campaign to arouse the citizenry to action on the airport problems. Mayor D.B. McKay and city delegation greeted the Southern Star when it arrived at Drew Field in 1929. Further development of the field was halted by insistent demands that Tampa should develop a truly first-class airport where facilities would be available for both hydroplanes and land planes. The demands were inspired by promises from officials of the Pan American Airway System that Tampa would be made the base of that company's operations if such an airport would be provided. Enthused by the promises, the citizens approved a $750,000 bond issue to pay for the port, to be built on an island made by dredging in Tampa Bay off Ballast Point. A long, bitter fight ensued. Many residents in the Bayshore district objected vehemently to the proposed island airport, saying that it would lower their property values. Strongly backed movements were started to sell the city land in other locations. To settle the dispute, Mayor D. B. McKay appointed four outstanding men to serve on the airport committee: Franklin O. Adams, F. L. Judd, Captain George Perkins, and Lieutenant Philip Pratt. After lengthy deliberations, the committee reported that it favored Catfish Point on Interbay Penninsula. However, a majority bloc of six councilmen refused to proceed with the project, giving as their excuse the explanation that it would cost more than the $750,000 provided by the bond issue. The Tampa Tribune, which had fought long and hard for the island in the bay airport, insisted strenuously on going through with it. But the six obstinate councilmen would not listen, and plans for the airport in the bay were shelved. Thereupon, Pan-American, in disgust, abandoned the idea of establishing its base in Tampa and went to Miami in January of 1930. On Dec. 12, 1929, The Tribune came out with an early morning extra with the headline "$100,000 FIRE SWEEPS AIRPORT; 13 PLANES LOST." A firebug was blamed for invading the Drew Field hangar and torching every plane housed there. In 1933, when Tampa began planning projects to provide work for the unemployed with federal assistance, Drew Field came back into the picture. The city's lease on the 160-acre tract had expired, but the city finally succeeded after much squabbling, in buying it for $11,654, the amount at which it was appraised by the Tampa Real Estate Board. This purchase was made on Feb. 10, 1934. Work on improving the field was started as a CWA project 10 days later, $31,000 being allotted for it by the government. Another allotment of $46,000 was made by WPA on Aug. 7, 1935. Thereafter, development progressed steadily, allotments being made from time to time by the Civil Aeronautics Association. Three 7,000 foot long asphalt runways were built, lights ere installed, and other improvements made. By 1938, Drew Field was rated as one of the best in Florida. Less than 3 months after the beginning of WW2 in 1939, work started on a project which has meant more to Tampa than anything since the coming of Henry B. Plant's railroad in 1884--MacDill Field. See history of MacDill Field here. 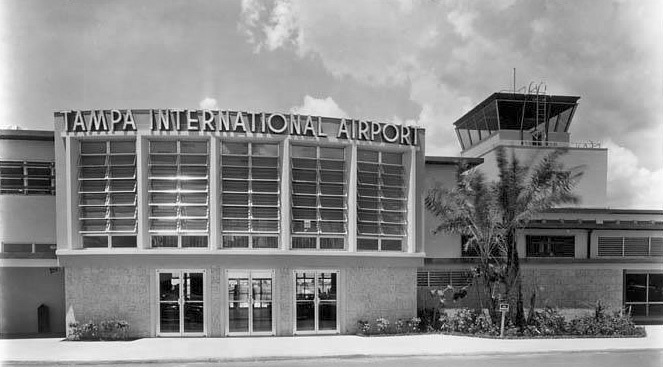 The more popular Peter O. Knight Airport was opened on Davis Island near Downtown Tampa in 1935, where both Eastern and National Airlines operated until 1946. Many of the planes arriving in Tampa at the beginning of WW2, unable to land at MacDill Field due to the runways not yet being completed, landed at Drew Field. In 1940, the army leased Drew Field from the city of Tampa for 25 years. In Oct. of 1940, the army leased an additional adjoining 400 acres. The United States Army Air Force took over Drew Field during World War II and expanded and modernized the airport. The airfield was used by the Third Air Force and renamed it Drew Army Airfield. The Third Air Force used it as a training center for an estimated 50,000 to 120,000 combat air crews and flew antisubmarine patrols from the airfield. Probably, the most number at the field at any one time was around 25,000. There was one accident in 1943 that killed five fliers. Despite this, Drew Field set a safety record for the Third Air Force in 1945 after 100,000 flying hours had been completed over a period of 10 months without a fatal incident. The aircraft operated included the B-17, C-47, AT-6, B-25, and others. Drew Army Air Field is described in "Drew Field Echoes" Vol 1, Issue 1 as a "lusty youngster among Uncle Sam's military airports." Preparation to build the base began in Dec. of 1940. Buildings and barracks were built, and in Aug of 1941, work on the runways began with a ceremony that included burying a paving brick each from the cities of Tampa, St. Pete and Clearwater, in the first buckets of concrete poured. Read the full article above, right: "Col. M. B. Asp Prominent In Aviation World"
Below is the full article above, left, that appeared in Vol 1, Issue 1 of Echoes. The growth of Drew Field, one of the Army's newest air bases, has been a source of comment among both military and civilian airmen. Yesterday a cow pasture, almost overnight a modern flying field and school, humming with activity. Such is the picture presented by Drew. It's early history is uneventful. A private landing field, the property was acquired by the city of Tampa in 1928 for the purpose of establishing a municipal airport. At that time, Drew presented the dreary prospect of damp marshy land, stretches of sand covered over with a sparse growth of palmetto scrub. Practically nothing was done toward the development of the project until January, 1941, the United States government took over and plans were laid for the militarization of the site. Only then did the story of Drew Field begin to unfold. Lt. Henry M. Sallery, Engineer Corps, was ordered from MacDill Field, Dec. 1, 1940 to supervise the preparation of the abandoned field for military use. Under his supervision, administrative buildings and barracks were erected. Jan. 16, 1941, Capt. James C. Hardwick, Air Corps, arrived, attached to the 27th Air Base Squadron and assigned to command of Base Detachment, Drew Field. He was accompanied by a force of 31 men, half of whom were detailed for guard duty. June 12, 1941 - 3rd Interceptor Command arrives, Gen. Walter H. Frank, commanding. Special Orders No. 112, MacDill Field, dated May 7, 1941 relieved Lt. Col. Melvin B. Asp from assignment with the 44th Bombardment Group H and reassigned him to Air Base etachmen [sic], Drew Field and designated him as Commanding Officer of the field, still a substation of MacDill. On August 18 of the same year, ceremonies celebrating the starting of work on the $663,700 runways were held. An interesting highlight of the dedication was the burial, by Col. Asp, of a paving brick each, from the cities of Tampa, St. Petersburg and Clearwater, in the first few buckets of concrete poured, thus symbolizing the union of social business and recreation interests of those places with Drew Field. The selection of Col. Asp as first commander of the new independent field had its sentimental as well as military aspect. Col. Asp is a native of Tampa, having been graduated from Hillsborough High School. He began his army career in 1916 which necessitated his leaving the city. He had been a frequent visitor having flown in and out of the old Drew Field many times. The Colonel assisted at its dedication as Municipal Flying Field in 1928. He knew the field in the days when John H. Drew, contractor and real-estate operator, co-developer, with Hugh C. MacFarland [sic], the cigar king of West Tampa and adjacent sections, first bought the land and turned a subdivision into a private landing field. The Col. is well known as a designer of the Asplane, which has been described as the first successful small plane. He has been closely associated with aviation all his life. Dec. 7, 1941 - War in Pacific. War declared on Japan. War declared on Germany and Italy. Dec. 14, 1941 - 1700 enlisted men arrive from Camp Wheeler (3 train loads). Captain Hardwick and Lt. Sallery were promoted to the grades of Major and Captain, respectively, in Oc.t 1941. Major Hardwick as continued in command of the present time.In January, this year, Lt. Col. Asp became a full Colonel. 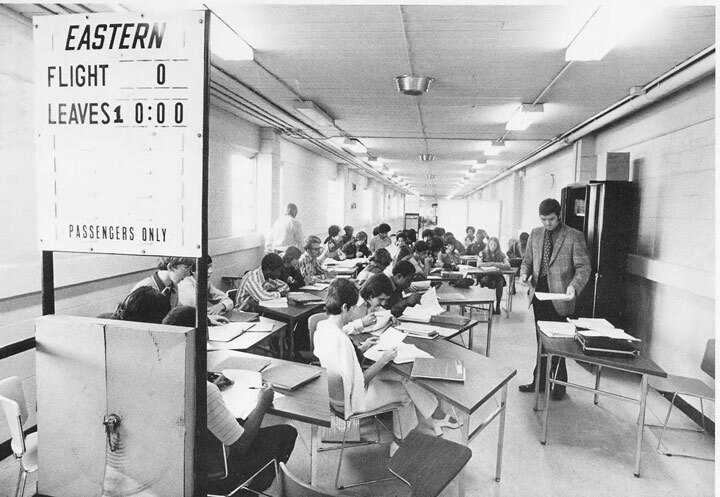 About the same time Drew Field became a school center for the Air Warning Service. And so the growth continues. An active future is envisioned for this lusty youngster among Uncle Sam's military airports. The "Echoes" staff: Seated at desk, editor Cpl. Jesse S. Zimmerman, formerly with the Baltimore Sun. Standing, L to R: Pvt. Jackson K. Stewart, feature writer for the Signal units and Special Services; Pvt. Herman "Pete" Peterson, feature sports writer and formerly with the Philadelphia Record; Pfc harold R. Bradley, feature writer for the Hospital and Medical Detachment; Pvt. Delwyn Baggett, sports editor; Pfc. Alvin M. Amster, feature writer for the Thrid Fighter Command; Pvt. Edward H. Solomon, art editor. In 1946, Drew Field was inactivated by the Army, and turned over to the Federal government. Later, the Federal government deeded most of the Drew Army Air Force Base to the Aviation Authority and Tampa airline operations, including National and Eastern Airlines moved to Drew Field from Peter O. Knight Airport on Davis Islands. The reason for the relocation was that the Peter O. Knight Airport was too small to handle the new Douglas DC-4, DC-6 and Lockheed Constellation prop-liners that were being placed into service. During this period the airlines were housed in the former Base Operations Building which was converted into a terminal. When National Airlines inaugurated international service December 15, 1946, Tampa's Mayor Curtis Hixon (standing left of plaque) received a commemoratory bronze plaque from W. L. Waring, Jr., vice president of the Tampa Chamber of Commerce. American "señoritas" from Tampa's Ybor City wore brilliant traditional gowns and lace mantillas on the initial flight to Havana, Cuba. 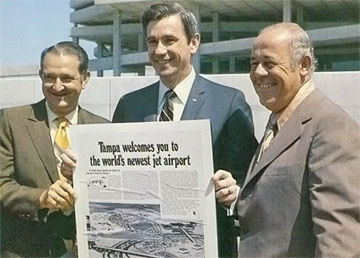 Trans Canada Airlines also inaugurated international flights and Drew Field was renamed Tampa International Airport. Eastern Airlines ticket office at the Tampa Terrace hotel, downtown, Oct. 19, 1941. Tampa's International Airport at Drew Field, 1947. A presentation welcoming Eastern Airlines to Tampa International Airport at the Drew Airfield site on February 20, 1951. Notice the passenger terminal in the background, formerly the base operations building of Drew Field. Looking toward the future, the newly formed Hillsborough County Aviation Authority began to plan for a new and splendid terminal on the site of Drew Airfield. The new terminal was planned at what was then Columbus Drive and present day Westshore. (At the time, Columbus Drive crossed over Dale Mabry and straightaway connected all the way to the Ben T. Davis Causeway.) This became a reality on Aug. 18,1952, and like many other airport terminals before and since, was inadequate before construction could be completed. At the dedication ceremonies, Capt. Eddie Rickenbacker ruffled some proud officials' feathers by pointing this out in his customarily outspoken manner. The American Ace of Aces, Eddie Rickenbacker, was a successful race car driver, fighter pilot, airline executive, wartime advisor, and elder statesman. Few aces achieved so much in so many different lifetime roles. His twenty-six aerial victories came in only two months of combat flying, a spectacular achievement. His family name was originally spelled "Reichenbacher," Americanized to its more familiar form when the U.S. entered World War I. His father died when Eddie was twelve, and the youngster quit school to help support his mother. He found a job with the Frayer Miller Aircooled Car Company, one of the thousands of automobile companies that emerged in the early 1900's. Edward Vernon Rickenbacker was a man whose delight in turning the tables on seemingly hopeless odds took him to the top in three distinct fields. In the daredevil pre-World War I days of automobile racing he became one of this country's leading drivers, although he had a profound dislike for taking unnecessary risks. He had entered the auto industry as a trainee mechanic and made his first mark servicing the cranky machines of that day. In World War I he became the nation's "Ace of Aces" as a military aviator despite the fact that he had joined the Army as a sergeant-driver on Gen. John J. Pershing's staff. He was named by Gen. William Mitchell to be chief engineering officer of the fledgling Army Air Corps. His transfer to actual combat flying--in which he shot down 22 German planes and four observation balloons--was complicated not only by his being two years over the pilot age limit of 25, but also because he was neither a college man nor a "gentleman" such as then made up the aristocratic fighter squadrons of the air service. In the highly competitive airline business, Mr. Rickenbacker was the first man to prove that airlines could be made profitable, and then the first to prove that they could be run without a Government subsidy and kept profitable. This, despite a previous venture in the automobile manufacturing business that fell victim to the competition of bigger companies and failed. While his successes came in fields that were developed in the 20th century, his philosophy seemed to many a carryover from the 19th century. In 1928 Mr. Rickenbacker became a $12,000-a-year assistant sales manager of the Cadillac division of the General Motors Corporation. He then was transferred to the big company's various aviation divisions. In 1934 he was sent as a trouble-shooter to salvage what he could of General Motors' Eastern Air Transport Division, which then owned Eastern Air Lines jointly with North American Aviation. The companies had sunk about $6-million into Eastern, but while the line had little competition on its choice New York-Miami routes, it was called the ugly duckling of an industry not then notable for successes. Mr. Rickenbacker's job was to shore up the failing line so the owners could sell it for their $1-million asking price. In its first year under his management, Eastern turned in a net gain of $350,000--the first profit in the history of the airline industry. The second year he doubled the profits. By the third year, when the Government ordered G. M. to sell its airlines or get out of aircraft manufacturing, a banking syndicate offered more than $3-million for Eastern. Mr. Rickenbacker pleaded with his employers for an equal chance to "save the airline for the boys and girls who helped build it." He received 60 days to raise the money and was told the company would be his for $3.5-million. The night before the option expired he got his final commitment, and the next day, March 2, 1938, he owned Eastern Air Lines. Mr. Rickenbacker ran his company in much the same manner he had commanded the 94th Squadron in World War I. He set impossible goals, and then went out and achieved them himself before complaints got out of hand. He also applied other early lessons to the airlines. He was never the first to buy a new plane. Only when other companies had tested a new type and proved it satisfactory did he place his order. Under Mr. Rickenbacker's dominance, Eastern was considered an efficient and profitable airline, but somewhat austere compared with many of its competitors. In the eyes of many travelers, its lack of emphasis on in-flight service and other frills gave it a Spartan image. Nevertheless, the airline prospered. For 25 years under Mr. Rickenbacker's guidance-- from 1935 to 1960--it earned a profit every year. Then, along with many other lines that were jolted by the financial headwinds accompanying the introduction of jet airliners, it experienced losses during the early sixties. In 1959, Mr. Rickenbacker resigned as president of Eastern, and four years later, on Dec. 31, 1963, he retired as director and chairman of the board. He died on July 27, 1973. Most of the above is excerpted from this NY Times obituary. Read the entire obituary here. St Petersburg Times article below from Google newspaper archives here. Capt. Eddie Rickenbacker, president of Eastern Air Lines, (before microphone, at left) predicted that the fine new airport would be outgrown and have to be expanded in three years. Cody Fowler, Tampa attorney, master of ceremonies, is shown at the extreme left. His law firm of Fowler White is still around. Speaking to Capt. Rickenbacker is J. Clfford MacDonald, chairman of the Hillsborough County Aviation Authority. At far right is former Florida Governor Doyle E. Carlton, who is the "Carlton" of today's prestigious Tampa law firm "Carlton Fields." A welcome shower brought relief from a hot sun shortly after noon yesterday as thousands of St. Petersburg and Tampa residents gathered to see the formal opening and dedication of the new International Airport at Tampa. They took shelter in the big airport building. A highlight of the celebration was a luncheon for about 300 distinguished guests from Pinellas and Hillsborough counties. From 10 a.m. until 5 p.m. the spectators inspected the bright and shiny new airport and then went aboard this big Eastern Air Line plane. It was the first time that many of the crowd had ever been in an airship and they lined up for hours just to get the thrill of a view. National Airlines and Trans-Canada Airline officials had a big part in the ceremonies too. Tampa's International Airport will be "too small to handle the air traffic that will pass through this area in less than three years" Capt. Eddie V. Rickenbacker, president of Eastern Air Lines, predicted in Tampa yesterday. Speaking at the dedication of the airport's new $1,000,000 terminal building, Rickenbacker nevertheless congratulated Hillsborough County's aviation officials for having planned an airport "big enough to handle the high speed transports that are on their way." Rickenbacker spoke twice, first at the dedication luncheon given by the Greater Tampa Chamber of Commerce for special guests in the new Bartke Restaurant on the terminal building's second floor, and later during ceremonies in front of the building, when he presented the airport flag to J. Clifford MacDonald, chairman of the Hillsborough Aviation Authority. Heavy rain, descending about a half an hour before the dedication ceremony was to begin, drove thousands of spectators to shelter inside the terminal building, and postponed the starting of the cermony almost an hour. In his luncheon speech, Rickenbacker recalled that he received the first air mail contract in the U.S. 30 years ago when he came to Florida with Ray Chambers, then head of Florida Airways. "We had one four-passenger airplane for the Jacksonville, Tampa, Miami run," he said. "Our headquarters was a little 8 by 10 shack in a cow pasture, serving as terminal station, operations house, radio house, everything. I happened to be the line's first stockholder, but as things turned out, I became its first stuck-holder." In presenting the airport flag, Rickenbacker said he was grateful for having lived in what is probably the country's most exciting period. The American flag, he said, "symbolizes the freedom and individuality of man, the American way of life and American opportunity. It has inspired generations to the degree that our land has grown to world leadership." MacDonald accepted the flag and it was raised to the top of the airport flagpole whie the 740th U.S. Air Force Band from MacDill Field played "The Star Spangled Banner." Main address was made by former Governor Doyle E. Carlton, president of the Florida State Chamber of Commerce, who dedicated the airport "not only to the prosperity of the state but to the welfare of the nation and the world." Carlton emphasized that Florida, as the halfway stop between North and South America, is a natural center of aviation, with no mountains to obstruct flight, and no fogs to confuse the fliers. Already, he said, Florida has 189 air fields, more per capita than any other state in the union, as well as more owners of private planes. Investments in Florida's airport facilities, he asserted, are already reaching the billion dollar mark. Aviation's greatest promise, however, he concluded, is that it may bring to mankind universal brotherhood, of which the new airport is a symbol. Acting as master of ceremonies at the dedication was Cody Fowler, past president of the National Aeronautic Association as well as the American Bar Association, who drew the bill creating the Hillsborough County Aviation Authority. Calling the occasion "a great day in the history of Tampa," Fowler recalled that "from this very field the Southern Cross jumped off some time in the 1920s on the first North-South flight to South America." Tampa, St. Petersburg and the West Coast he declared, have been linked with aviation from the beginning. Also speaking at the dedication luncheon were John Morris, vice president of National Air Lines who substituted for President G. T. Baker, and W. Gordon Wood, vice president of Trans-Canada Air Lines, for President G. R. McGregor. Morris recalled that National had been awarded its first air mail contract 18 years ago and began service on a route taking in St. Petersburg, Tampa, Orlando and Daytona Beach. Gordon Wood revealed that business gnerated during Trans-Canada's first 18 months of operation through Tampa had exceeded expectations. He predicted that TCA would bring an ever increasing volume of international traffic through Tampa's "Gateway to the North." Presiding at the luncheon was David A. Falk, president of the Greater Tampa Chamber of Commerce, while Eugene R. Elkes, vice president, acted as master of ceremonies. Distinguished guests included Mayor Curtis Hixon of Tampa, Mayor Sam T. Johnson of St. Petersburg and mayors of other surrounding towns and cities; C. F. Horne, administrator, Civil Aeronautics Administration, and D. W. Nyrop, chairman, Civil Aeronautics Board; Wing Commander Owen Roberts, president, Caribbean International Airways; Courtney Campbell, Democratic candidate for Congress; and members of the Pinellas County and Hillsborough County Commissions. For Gen. Frank Armstrong, commanding MacDill's Sixth Air Division, it was a memorable occasion, being the tenth anniversary of the first daylight raid over Europe, in which he led a group of B-17s in an attack on the marshalling yards at Rouen-Cottsville, France. 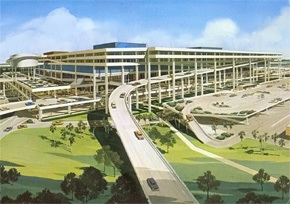 The new Tampa International Airport in 1952, Columbus Drive at Westshore. The building, which was built for three airlines, was soon swamped. 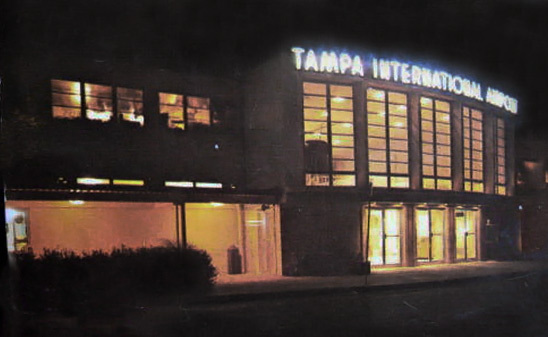 The Civil Aeronautics Board granted Capital, Delta, Northeast, Northwest and Trans World Airlines authority to fly to Tampa during the late 1950s and as a result created havoc at the undersized terminal. An annex was built east of the terminal to accommodate the new carriers. Nonetheless, with its glamorous Bartke’s restaurant on the second floor overlooking the busy ramp, and its space for various auxiliary offices, the terminal was a source of pride to citizens of the area for several years. "On a sweltering August day, 300 dignitaries crowded into Bartke's Restaurant, the terminal's "ultra modern" steakhouse. 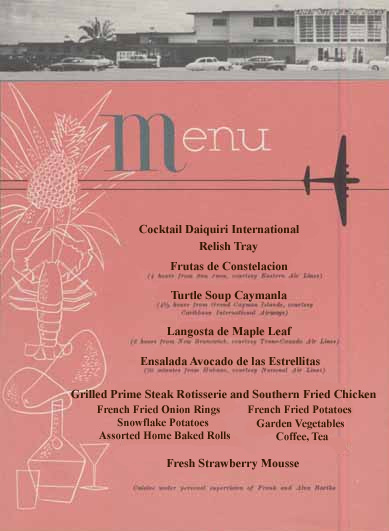 In a publicity stunt for the dedication, airlines flew ingredients to the restaurant from all over the hemisphere: fruit from Puerto Rico, avocado from Cuba, turtle from the Caymans and lobster from Canada. If the menu looked lavish, the guests were not always comfortable. The dining room's air conditioner failed, forcing the suited dignitaries to wipe their brows with cloth napkins. The heavy meal of steak, potatoes, fried chicken, onion rings and lobster must have seemed regrettable once the men joined a crowd of spectators on the tarmac in the insufferable summer heat. For the next five hours, important people gave predictable speeches. Finally, the Air Force band from Mac Dill played the national anthem while the flag was raised. Then three small propeller planes landed and taxied nearby. Tony Pizzo, a local liquor dealer and historian, emerged from one of the planes dressed like a dictator of a banana republic. Posing as the "mayor" of Ybor City, El Jefe kissed the hands of ladies in the crowd, while his cohorts gave away loaves of Cuban bread. He apologized for his tardiness, and joked that menacing UFOs had thrown him off course. He then presented Mayor Curtis Hixon with the key to Ybor City, and everyone had a good laugh." 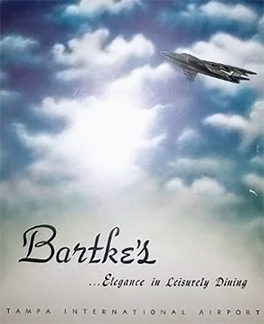 Bartke's was started by and owned by Alva and Frank Bartke. A prominent restaurateurs family, they owned the Causeway Inn, the Rocky Point Dinner Theater, the Careless Navigator Restaurant on Treasure Island, and the Red Cavalier on Madeira Beach. The grand opening of the T.I.A. restaurant took place on Aug. 17, 1952. Frank Bartke was born in Austria and came to the United States when he was 6 months old. He started his restaurant dinner club career at the Embassy Restaurant on Fordam Road in New York City. Frank and his wife, Alva, opened a 900-seat restaurant in Revena, NY in 1946 where Mr. Bartke gained fame when he introduced his rotary broiler steaks to the public. The Bartkes came to to Florida in 1948 and opened "Bartke's - Elegance In Dining" in the Edward James Hotel on Treasure Island. Alva operated the restaurant until Frank moved to Florida permanently in 1950. 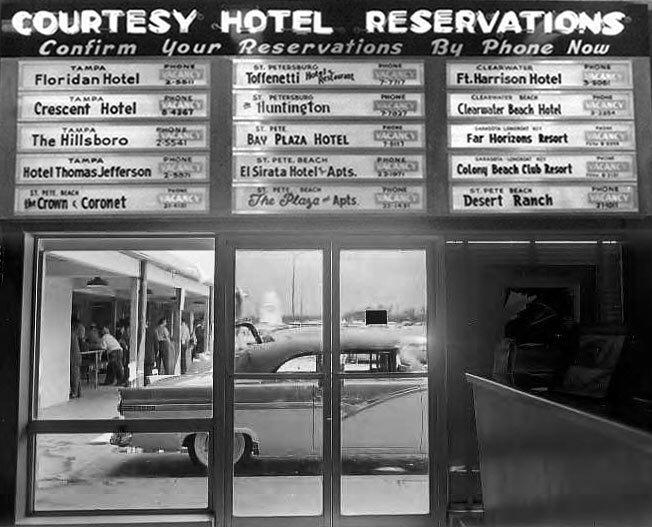 In 1952 they moved the restaurant next door to the Tropic Terrace Hotel. 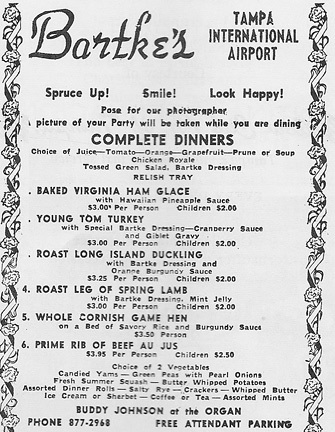 That same year, they started operation of Bartke's at Tampa International Airport. In the mid-1950s, Mr. Bartke purchased the Rocky Point area and in 1963, the Causeway Inn, North and South. He developed 250 acres behind the Causeway Inn, North to Memorial Highway. Part of this land he donated to the Egypt Temple Shrine. On Jan. 8, 1956, it was announced that Bartke's at Treasure Island and Bartke's at Tampa International Airport (along with Ciro's Supper Club on Treasure Island) were sold for $600,000 ($500,000 for Bartke's, $95,000 for Ciro's) to Joe Lefft, former Miami Beach restaurateur, and Phil Turk, former New Yorker and St. Pete resident. Plans were to change the name of Ciro's to Bartke's and begin a $50,000 renovation project that would allow them to open the restaurant by Feb. 1, 1956. Lefft and Turk also obtained permission from Tampa International Airport to expand that location by another 150 seats, enlarging the dining area by taking over the terrace over the airport building. By the time of the announcement of the sale, Lefft had already completed the installation of a new cocktail lounge at the airport location. Frank Bartke owned the Bartke Dinner Theater, formerly the Holiday Dinner Theater, from 1967 until his death due to a heart attack in September of 1979. He was 79. His son, Bill Bartke, was manager and emcee of the restaurant until mid-1974, at which time Frank took over the manager duties and Michael Smith became his assistant and emcee. Alva Bartke died in late 2005 in St. Pete. She was born in Brooklyn, N.Y., and moved to Florida in 1948 from Albany, N.Y. She owned and operated several local restaurant and lounges, including the Edward James Plaid and Tropic Terrace, both in Treasure Island, and the Tampa Airport restaurant. 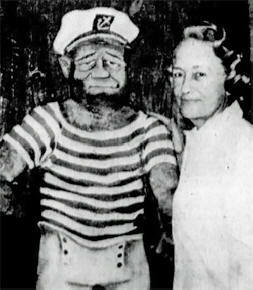 From 1960 until her retirement in 1984, she owned and operated the Careless Navigator in Treasure Island. She was a past member of the Treasure Islets, the Treasure Island Chamber of Commerce and the National Restaurant Association, from whom she received many awards. This photo provided by Angelo Rumore shows the Latin Fiesta group of 1957 going on their goodwill trip, probably to Cuba. Burgert Bros. photo from Tampa Hillsborough County Public Library. 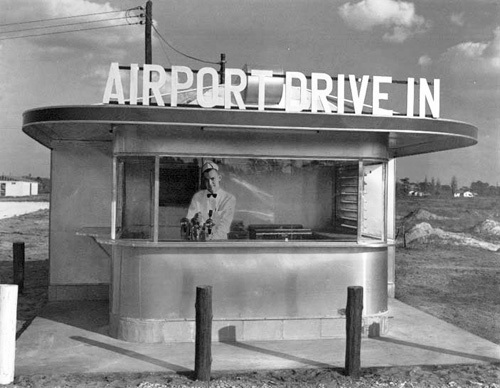 On your way to T.I.A., you could stop for a bite at the Airport Drive In at Dale Mabry and Columbus Drive. Pass you cursor over the photo to see landmarks labeled. Present day aerial view of old Drew Field and old Tampa International Airport. 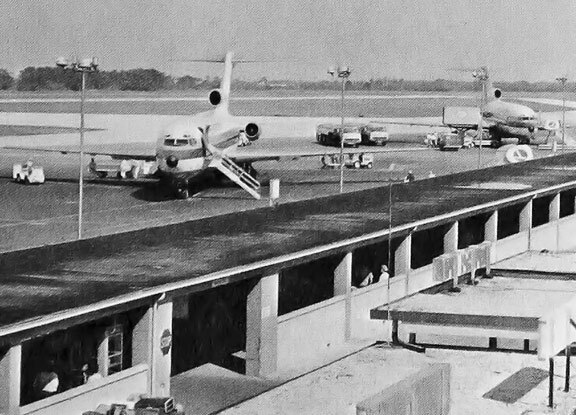 Tampa International Airport scene from 1966 Chamberlain High School yearbook "Totem." Jet-powered operations began in 1959 when Eastern Air Lines introduced the Lockheed L-188 Electra. The following year National Airlines began turbojet service with the Douglas DC-8 jetliner. Flights to Mexico City began in 1961 with weekly service by Pan American. Congestion became a serious problem at the terminal when the airlines began to replace their piston powered equipment with larger jetliners. As a temporary measure the old terminal was once again expanded to handle the growth in traffic. 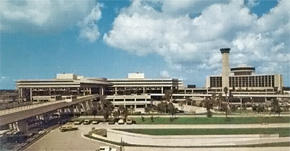 1968 aerial view of Tampa International Airport at Columbus Dr. and Westshore Blvd. The control tower and main terminal can be seen at the upper right corner of the structures. 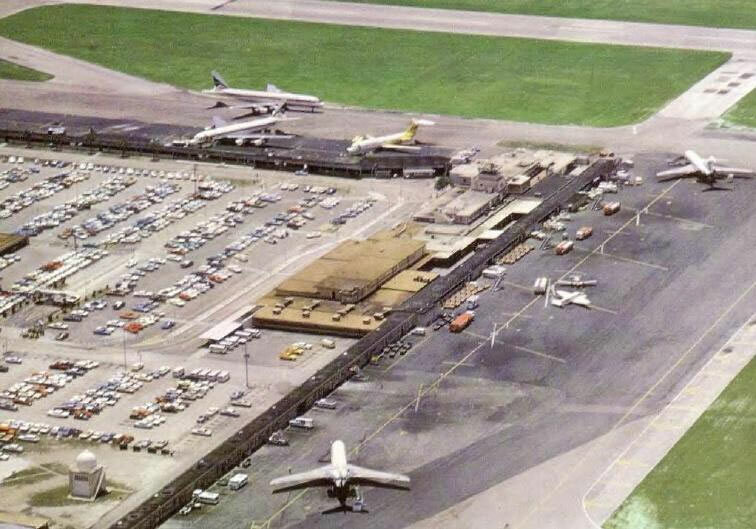 During the early 1960s, the aviation authority began making plans to build a replacement terminal in an undeveloped site at the airport. Airport leaders chose the Landside/Airside design in 1965 after a careful study of different types of terminals. Construction on the new terminal began in 1968 between the airport's parallel jet-capable runways. When completed in 1971 the new jetport was highly praised by the press. Prior to its official April 15 opening, 60,000 people toured the new facility during a two day open house event. 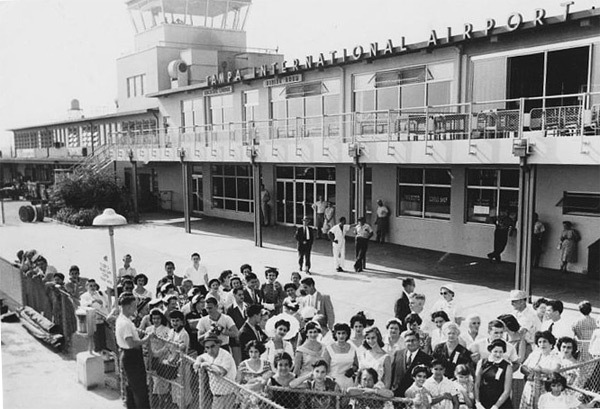 National Airlines Flight 36 from LAX was the first to arrive at the terminal. After touching down at 05:26 am the jet taxied to Airside E to disembark its passengers. After the new airport officially opened on April 15, 1971, the old facility was closed. 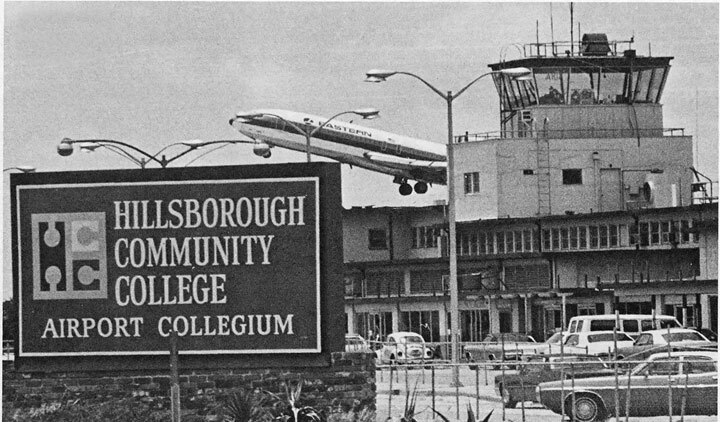 In the same year, the yet-to-be-built Dale Mabry Campus of Hillsborough Community College used the abandoned airport as their "Airport Collegium." Photos from the 1978 HCC yearbook "Satori." It was once the first glimpse tourists and new residents caught of the Sunshine State. The first handful of sand right outside the glass doors of the old Tampa International Airport terminal. Now the hallways, which once led out across the hot tarmac and onto a plane are gone--though there are some who claim they still hear the murmurs of a thousand hellos and partings. It was here that generations sent off their children or welcomed their parents. Now there is nothing but rubble and the roar of jets. An ultramodern terminal five years ago and a wrecker's ball now have been cruel to this building, more cruel than old age could possibly have been. Even a new life passed the terminal by when the Hillsborough Community College, using part of the building for classrooms, went off to a new home last year.